Vanilla Cream Cheese Buttercream - Let the Baking Begin! Cream Cheese Buttercream recipe is one of the basics that can be customized in many ways to change the flavor and sweetness. Add more sugar and use it for cakes. Add some fruit purée or jam and use it to fill macarons, cookies or cupcakes. The first time I made this Cream Cheese Buttercream, I was trying to come up with a versatile filling for macarons. 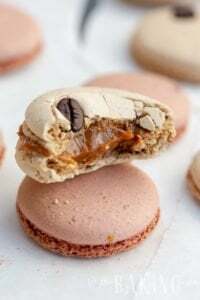 I needed something that wouldn’t be too sweet, something I could still add fruit purée to, to give it a flavor variety, something that had enough moisture to make my macarons that velvety smooth on the inside and of course, and something that pipes well too. 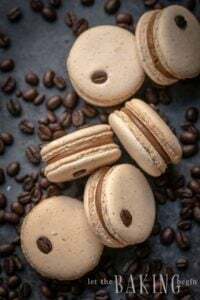 Well, I am here to announce that this Cream Cheese Buttercream macaron filling is all of those things! 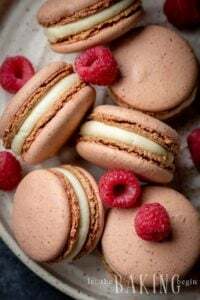 When customizing it for the macarons, I add 1/2 cup of good quality, fresh tasting jam and fold it gently at the end, to give this buttercream whatever flavor my heart desires. I have used Strawberry, Raspberry, Apricot, and Pineapple, as well as Peach jam with this Cream Cheese Buttercream and each time I fall in love with it more and more. 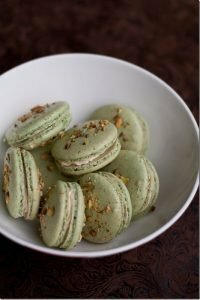 The macarons come out perfectly moist, while still retaining their signature crisp exterior shells. This Cream Cheese Buttercream and the White Chocolate Ganache are my two go-to fillings for macarons. Watch out for future posts to see how I use it in my macarons 😉 Stay tuned! Starting out with room temperature, but not overly soft butter is the key to success. You do not want butter that has sat out of the fridge all day long. You want the butter to be whippable, but not melty soft. Starting out with melty soft butter will give you soupy buttercream. You do not want that. Therefore, remove the butter out of the fridge for about 3 hours and that should give you the perfect consistency butter for this buttercream. Now combine the room temperature butter and cold cream cheese and whip on high speed for about 5 minutes, scraping down the bowl every couple of minutes. Next, add the powdered sugar and vanilla extract and whip for another minute. If you would like to add coloring, add it at the same time you’re adding the powdered sugar and whip until the buttercream is smooth and the food coloring is incorporated. Lastly, to flavor your Cream Cheese Buttercream, gently fold in 1/2 a cup of jam, preserves or fruit purée. Tart jams, preserves or puree work a lot better than overly sweet ones. Cream Cheese Buttercream recipe is one of the basics that can be customized in many ways to change the flavor and sweetness. Add more sugar and use it for cakes. 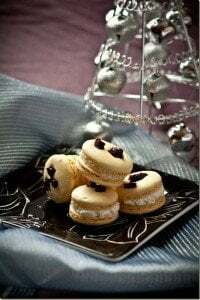 Add some fruit puree or jam and use it to fill macarons, cookies or cupcakes. Take the butter out of the fridge and leave at room temperature for about 3 hours, to get it to room temperature. Add the butter and cold cream cheese to a mixer bowl and whip, scraping the bowl several times throughout, for about 5-6 minutes or until the mixture is well whipped. Add 1 teaspoon vanilla extract and 1/3 cup of powdered sugar, then whip for another minute to get the powdered sugar well incorporated and the buttercream smooth. If adding food coloring, add it together with the powdered sugar and vanilla extract. Add 1/2 cup of tart fruit puree, jam or preserves (for every 1 recipe) to give the Cream Cheese Buttercream desired flavor. Add up to additional 2 cups of powdered sugar (for every 1 recipe) to this Cream Cheese Buttercream and whip until completely smooth. 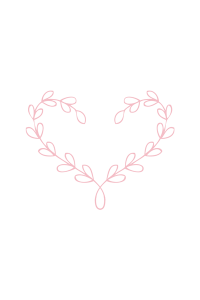 Dear, it’s very beautiful to see. I like your explanation. Useful, frugal and great ! Thank you !